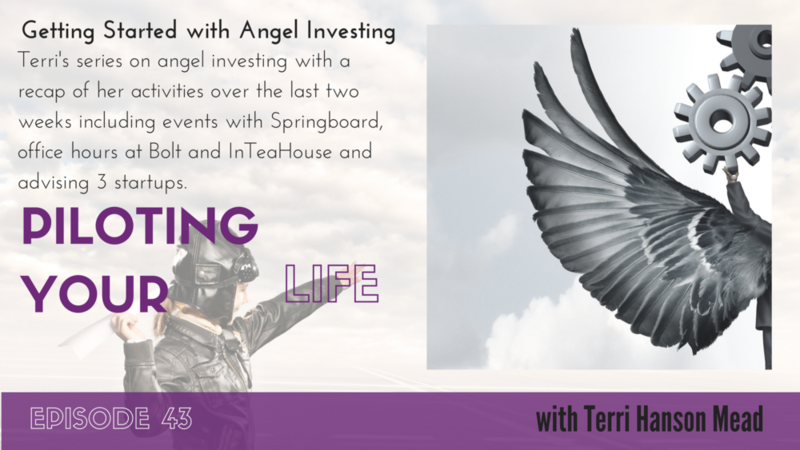 Terri continues with her series on angel investing with a recap of her activities over the last two weeks including events with Springboard, office hours at Bolt and InTeaHouse, her weekly advising of three startups, and plans for her trip to Europe in June/July with InTeaHouse. Terri attended Springboard’s Digital Health cohort final presentations and the pitches for the new cohort of biotech companies. Terri talks about the deal she is working on syndicating on AngelList called Sendaride. She is performing due diligence not for her own investing but for others who will be considering investing alongside her. She looked at the deal, the company, the management team, financials, projections, technology, the product, market opportunity, and sales. Terri talks about the office hours she held at Bolt on Brannan St. in SF. Terri did some office hours for some founders at InTeaHouse with about 20 founders with startups that crossed all industries. She provided some advice and guidance to the founders while she was there. Terri had registered for a MedTech Women event but had to skip it due to her busy schedule. Terri handles emails, calls, research on a daily basis. Terri is advising three companies including The Guild, Quinn Style, and Lisa Health and picked up half a dozen new clients through Tech Futures Group. Terri loves learning things in one place and applies it to other companies and people. Terri learns by doing and is learning as she goes along. It’s painful to see how ignorant she was two years ago and how much more needs to be learned. Terri talks about the European fireside chat tour she is going to do with InTeaHouse where she will be visiting Geneva, Zurich, Munich, Berlin, Tel Aviv, Vienna, Slovakia, and of course, Paris.